I'm just back from a truly delightful meeting of the Midwest Political Science Association in Chicago. Other than a creepy me-stalking meme and some underwhelming smelt at Miller's Pub, it was a big success both professionally and socially (as though I could still distinguish between the two). I was invited to participate in a roundtable discussion called "Toward a Greater Dialogue: Political Scientists Meet Journalists," chaired by Lynn Vavreck. John Sides and I represented the world of political scientist-bloggers, while the journalists were Craig Gilbert of the Milwaukee Journal-Sentinel and James Warren of the Chicago News Group. (Gilbert maintains the Wisconsin Voter Blog. And be sure to check out Warren's recaps of MPSA for The Atlantic, here and here.) The roundtable made for a really nice discussion (and should be available in podcast format soon), but I wanted to revise and extend my remarks a bit here. Journalists-meet-political-scientists panels are becoming a regular feature at academic conferences, and I think this is a positive development. If I may draw an historically inspired (if probably inappropriate) analogy, journalism a few years ago was like Kate Winslet in Titanic -- lovely, enjoying first class, but lost in its own world and its own problems. It was largely oblivious to political science (Leonardo DiCaprio in this scenario) -- smart, wanting to impress journalism, but carrying a bit of a chip on its shoulder. In recent years, though, we've begun seeing each other, dancing to Irish music, enjoying the occasional hook-up in the jalopy, enriching both our lives. Obviously I don't want to push this metaphor too far, since it results in political science frozen to death at the bottom of the North Atlantic. But I think one of the things that has brought us closer together in recent years (other than Billy Zane or sea ice) is blogging. 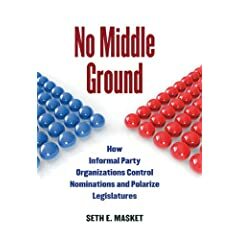 Nyhan, Drezner, Bernstein, Putnam, Greene, Dionne, Glassman, the crews at the Monkey Cage and LGM, and many others have been working at making political science research more accessible to journalism and to political observers at large. (I've been trying to do my part, as well.) It was extremely heartening to read, for example, Mark Blumenthal's coverage of the early presidential primaries and caucuses, or this article from the Idaho Spokane Spokesman Review quoting four political scientists on the topic of Tea Party influence in state legislatures. I took these as evidence of the political science perspective working its way into mainstream political coverage, and while these things could have happened without blogs, I'm pretty sure blogs made them more likely. While I believe this growing relationship between journalists and political scientists has helped to improve the quality of political coverage, it's clear we're not reaching everyone. 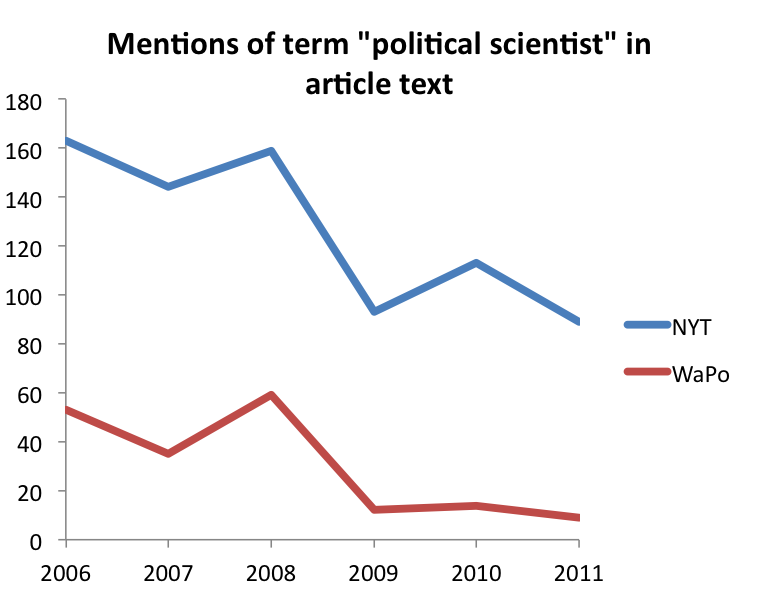 I was curious if it was possible to measure political science's penetration of journalism. Below is one attempt: I used a Google News search to count the number of times the term "political scientist" appears in the text of New York Times and Washington Post articles annually. This is far from a perfect measure. Nonetheless, two trends emerge: we are quoted more in election years, and we are quoted with decreasing frequency. Now, as Sides pointed out, if our perspective is being adopted by journalists, maybe they don't have to quote us at all. But it's also possible we're just reaching a small group of journalists, although perhaps they will influence their colleagues. I certainly don't expect us to reach everybody. I imagine the Chris Matthewses and Maureen Dowds of journalism will continue to claim that politics is driven by "narrative" and personality and manliness and tone and clothing and that elections are won by the taller candidate with the best smile whom you most want to have a beer with. But I still imagine we can reach more people. The question is how. I was heartened during the roundtable to hear the journalists (including one in the audience) say that they actually want our input in their stories -- they seem to think we have something useful to say. One reason they don't always include us is because there are only so many hours in the day, and we have a penchant for droning on and on with caveats and jargon. I think many of us are guilty on this count, and it would frankly be good for us to learn how to describe our research, and that of our peers, with the journalistic audience in mind. Many of our schools offer media training, teaching us how to talk to reporters. We should do this training. Not to dumb down our work, but to learn how to describe it in a way that seems interesting to a broader audience than three reviewers for the American Political Science Review. 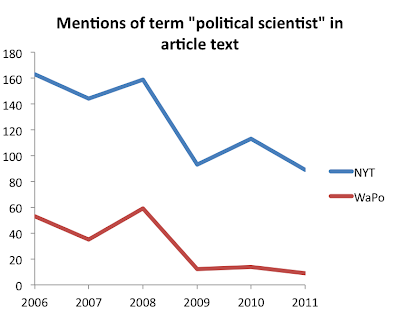 I'd also like to encourage more blogging by political scientists. The ability to boil down ongoing research into a few punchy paragraphs is a great skill to have, and not just for talking to reporters. Lynn Vavreck also suggested some sort of poli sci boot camp for journalists, where we spend a day talking to reporters and describing how we approach research questions. And as the reporters made clear, just getting into each others' Rolodexes is a great start. They'll call us if they know who we are, and we should feel free to call them if we have an idea for a story. I left the roundtable feeling quite encouraged for the future of both political science and political journalism. I'm hoping this conversation is just getting started. Oh wow, the APSR must have added a new reviewer. Exciting!! mfpb! Just a tiny side point - the Spokesman Review is published in Spokane, WA. It does have substantial service territory in Idaho (Spokane is substantially closer to much of the Idaho panhandle than is Boise) - so the article you linked to focuses on the Idaho legislature, and how it is following similar patterns to several other state legs - and the article itself is bylined "Boise" - but the paper itself is really a Washington, not an Idaho, paper. Don, thanks for the tip. FWIW, I prefer it when the university departments in question as described as the "department of politics" with "professors of politics," as opposed to political scientists. "Political science" doesn't very aptly capture what the discipline is really about and smells of delusions of grandeur. Indian Packers and Movers in Mumbai provide service right from picking up parcels from your desk to delivery at the destination door step, including taking care of all related matters. Packers and Movers in Mumbai providing 24X7 customer care service for its new and lifetime valuable clients.